My first thought for dinner last night was, “Takeout.” Then I remembered my withering bank account. And my waistline. And my cholesterol. My second thought was leftovers! I rummaged through the refrigerator, and since I was only cooking for one, decided I’d throw what I had into a pan and see what happened. Turns out… not so bad. Add water and salt to a medium saucepan and turn to high heat. While you’re waiting for the water to boil, add butter to the skillet you cooked the bacon in and turn the heat to medium/low. Once the butter is melted, add the spinach. (This is the time you’ll want to add the couscous. Add couscous to boiling water, stir immediately, turn off heat and let sit covered for 4 minutes). 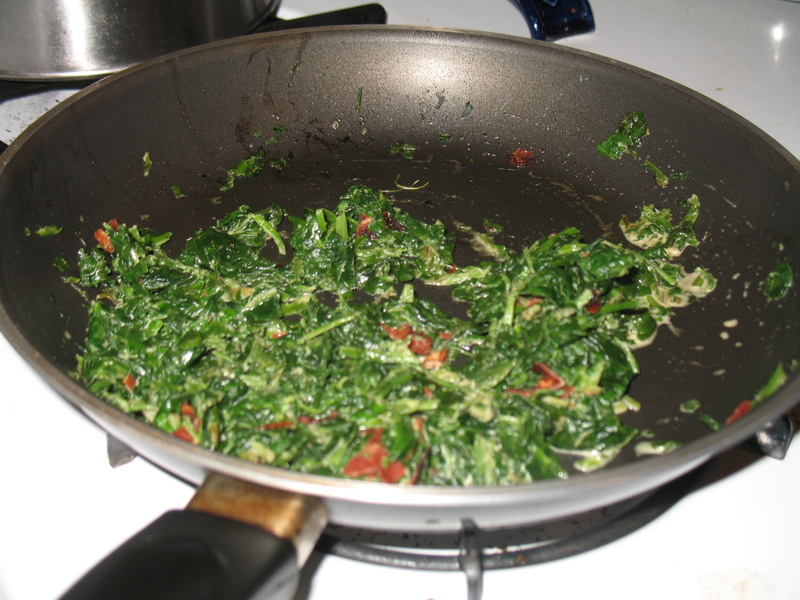 Cook spinach until it is wilted and warmed up. Add garlic salt. Add cream and mix until incorporated. Add spinach to the couscous and stir. Add almonds and serve.